OK, so, since racing at Pimbo I’ve been all over the place. Got a few nice long rides in, including a semi off-road sportive over in Bowland, which was nice. Riding ‘cross bikes away from the race scene is always fun, especially if the countryside is suitably epic. As such, a follow up ‘cross ride over in Calderdale, as organised by Emma, with even more hills and even tougher off road sections seemed appropriate. If you’ve not done the Green Jersey’s “Gravel Rush” or the equally ace “Clifcross”, I can recommend them both. The “almost a tradition now” Battle on the Beach went Not Well. I didn’t run fast enough at the start and saw the gap to the front group slowly, almost hideously, open up in front of me as the fast guys pulled away from the gaggle of riders I was in. I tried to fling myself off the front of the group, using riders falling back from the fast group to leapfrog further and further towards it but the empty space ended up being just too far, so I had to drop back into the 2nd group across the sands. Luckily, Pembrey is a nice enough place to spend a weekend even without the race, so I treated it like a little holiday. Semi-win. Phil and I headed up to Scotland to meet up with Jase, Guy and Sam on their fundraising mega-daft-ride from Coast to Coast to Coast to Coast. Although they were too far behind schedule to play out on the trails at Ae forest as we’d planned, we still managed to tag along as they hot footed it along the A75 to get to the ferry on time. It was a pretty grim ride TBH, we rode over to Castle Douglas, got fed up of being cold and wet (it was bucketing down by this point)said goodbye/good luck and rode back to the campervan to warm up. 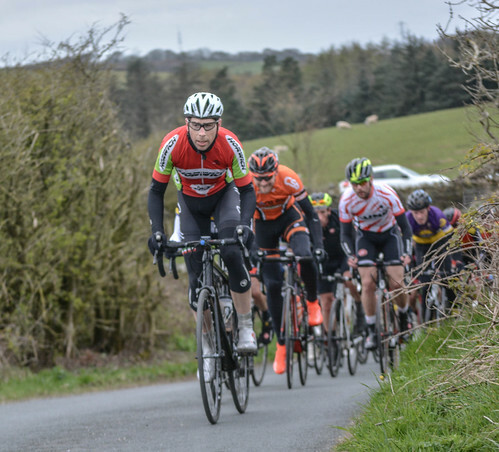 That done, last Sunday had me back on the road bike for another road race. More lumpy than the Pimbo course I had high hopes for a break getting away this time, so stayed up near the front as much as possible. If I’m being honest I knew I was sitting out in the wind more than I should have been, but it was fun trying to split the pack by pushing the pace along and no-one seemed to be able to stay away for long – a couple of people went for solo escapes, but never opened up gaps big enough to get out of sight – so I hoped the pace would break up the group on it’s own.